eyy, so there's only gs6 available for testing? how about m9? "Wow I am amazed with the camera performance of the iphone 6. It is like it is from out of the world OMG! I must get one for me and for rest of my family asap. I will impress my friends on instagram so they will think i am a badass pro photographer." Said no android user ever :) I would definitely buy iphone 6 if the year was 2009 tho :) Congrats my dear beast Note 4.
iPhone 6 low light video is terrible and on top of that it suffers from very pronounced flickering. Look at Infinity Tower sign. AnonD-266350, 20 Mar 2015u r sooooo pathetic dude & really blind 2 . the iphone 6 was so bad & there is no comp... moreI am not blind, so I can see narrow dynamic range: look at the detail in very bright and very dark areas. The S6 appears to be really good, the iPhone is up there too, while the Note 4 and the S5 are lacking. But if you like the S5, more power to you. It goes well with your awesome language skills. Appreciated if you can include Lumia camera phones like 1020, 1520, or 930 to the arena. I mean, if you can include iPhone 6, why not Windows Phones?? We are not talking about the OSes anyways. 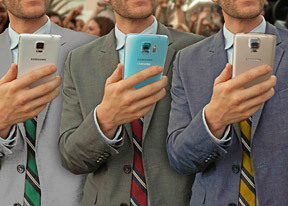 Galaxy S6 is the winner, and Note 4 is very near. Nice work Samsung! I love how Samsung work good on smartphone camera. Unfortunately Samsung gone in wrong direction about sdcard/battery.. and is very expensive. Without this 2 mistake, for me, it's the best smartphone and cameraphone. Iphone 6 was good on the 2013... damn 8 megapixel and no innovation! "The wider f/1.9 lens on the Galaxy S6 is not as sharp as the f/2.2 lens on the Galaxy Note 4." Is this a fact or do you mean to say at f/1.9, the S6 lens isn't as sharp as the Note 4 at f/2.2? barameus, 19 Mar 2015"The Apple iPhone 6 is a new device though its basic camera hardware has gotten only incr... moreSame here, why not milk the sheep as much as you can?! "The Apple iPhone 6 is a new device though its basic camera hardware has gotten only incremental improvements since the iPhone 4S"
The S6 may be providing more natural photos in applying less processing. Still, the N4 picked up the pattern on the red carpet in the shootout - the S6 didn't. Make your pick. Note 4 is impressive... iPhone 6 is just sad. [deleted post]How is the S6 a cheap clone when the iphone copied Samsung and the S6 more expensive and advanced parts?